When I was a kid, we had to do the President's Challenge for physical fitness. I failed every time, because I could not do a pull-up. Every year, I would watch the little monkeys in my class who could do a bunch in a row, and then I would get up there and struggle mightily while the P.E. teacher would say something like, "I think you did...one-quarter..." and make a note on my sheet. I wished to avoid this humiliating display in the future, but I had no idea how. Every so often, I would go out to my swingset int the backyard and hang until my shoulders felt like they were going to pull out of their sockets, but I never could do a single pull-up. I think of this when I have a student who requests to learn a piece well beyond their ability level. I think an exciting, challenging piece can be a great motivator, but there is a point where a piece can be so difficult it is truly inaccessible for the time being. The student will try and try, like I did with my hopeless backyard strength training, and get no return. What's the alternative? Systematically breaking it down (yes, sorry, sometimes you have to be a geek if you want to do a thing well). Unfortunately, when I was a kid we did not have the Internet, but if we had, I would have been able to research pull-ups to learn how to do them, including ways to make them easier. I could learn about the muscles used in pull-ups, and create a plan for building strength in those muscles. I might also acknowledge that overall upper body weakness is an issue for me, and create a complete plan for strength training with the help of a personal trainer. Maybe, after six months of focused, targeted, and carefully sequenced training I would do a pull-up on the first try. From there, I would finally build up the number of reps I could do in a row. By contrast, I could take those same six months and spend a few minutes every day trying to do a pull-up to no avail. 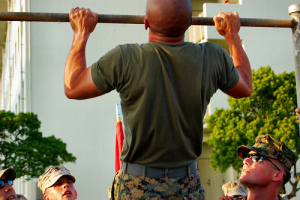 I strongly doubt I would be able to do a pull-up after six months of that, for two reasons: One, I wouldn't even get to the point where the correct muscles were supporting my body weight; and two, I would probably get bored and frustrated and quit three days into it. So, back to the musical example. Usually, students have great intuition about which pieces are right for them to learn. But occasionally, not. "I want to learn 'Cliffs of Dover' because it's my favorite song on Guitar Hero." Okay, fine. Go ahead and download the bazillion-page tab and set about learning it. Learn a tiny lick every day. If you don't go mad in frustration within the first ten minutes, after six months you might be able to play the whole thing (if I painstakingly show you how to play every note that you can't figure out on your own). On the other hand, you could spend those same six months learning fifty easier songs that use similar skills and a similar vocabulary. You can build fluency, speed, and technique while improving your musical ear and your reading skills. After six months have passed, you may well be able to pick up most of "Cliffs of Dover" by yourself in just a week or two. You might not even need the tab for very much of it, because your fingers will "hear" different parts of the song and automatically go where they belong as a result of playing so much. Because in the process, you learned fifty other songs. You learned how to play the guitar, not just "Cliffs of Dover." They say you must leap across a chasm in a single, dramatic, all-in move. Or you could go to school, become a civil engineer, and design a bridge that will enable you to easily walk across. The first way only works if it works, and most of the time it doesn't. The second way is built to work every time. Not as daring, but you'll get there in the end. Where are you attempting with no visible progress? Is there an intermediate benchmark you could be striving for, or a more systematic way to achieve your goal?